Here are some illustrations of these scarce trident types. I no longer have copies of Type 8 (Lubotin). Most of my material originates from the Vyrovyj collection, though I have also found used copies of the more common types in accumulations of regular Kharkiv I tridents. Type 4 on the 3rouble 50 is illustrated with a Parcel Card fragment from Dr Seichter's collection. 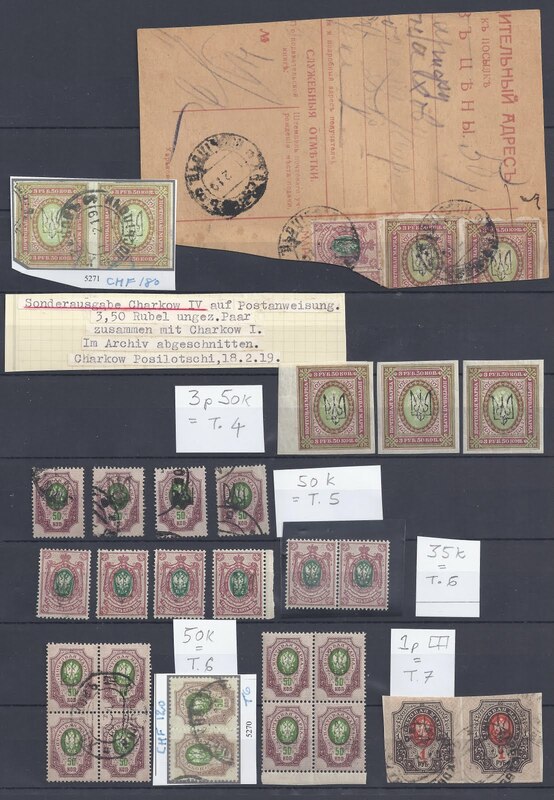 It can be seen that the postmark is the same as that on a pair sold a few years ago at Corinphila. The mint copies show the distinctive feature - a dot at the top of the central spike. Type 5 on used 50 kopeck copies normally has the appearance of an over-inked rubber handstamp. In contrast, Type 6 is always fine and crisp in a light ink. 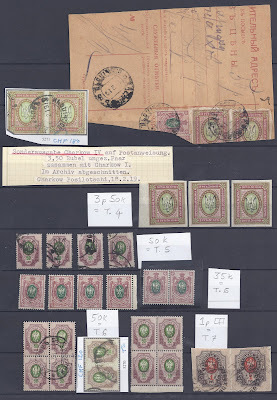 It is shown here on mint 35 kopeck stamps and mint and used 50 kopecks. Note that the Voksal cancel on the used 50 kopeck is also to be seen on the catalogue illustration of a pair sold at Corinphila a few years ago.. Type 7 seems to be much scarcer than the previous three. I have only a used pair of 1 rouble imperforates. The ink is like that of regular Kharkiv overprints. On the left hand stamp, the distinctive bulge in the body of the Trident can be seen clearly. There are numerous signatures on these stamps. I noted on one of the Type 5 stamps the small red Soviet guarantee mark which is the genuine version of teh fake large Soviet guarantee mark about which I blogged recently.